Who doesn’t love cooking with just five ingredients!! We are busy busy running around all week, have to get the kids to practices, games and groups of some sorts, or how about some of my other friends who don’t really enjoy cooking like I do but still need to get a decent yet hearty dish on the table for your family?? Come on I know your out there! Well this is the theme for you then. Today’s event is being hosted by Alice of Hip Foodie Mom. Thank you for hosting this fabulous event Alice! Who out there likes spaghetti squash?? Well yes that’s me in the front row waving my hand all around yelling “me, me, me! !” A dish I never had growing up, a vegetable that I just never tried until I started to eat more healthy. I’m pretty sure I made it for my husband once and he wasn’t happy that “that dish” replaced his starch of choice for the evening. Yes he’s a meat and potatoes kind of guy so I’m not going to push him when he eats so many other things I put in front of him! Now that I think of it, I’ve yet to try and fool my picky toddler with this dish too, I can see the look on her face when I try telling her it’s “Spaghetti”. Hey I’m not lying it is! I buy one every few weeks to make for lunch when I’m home with the kids. Every time I make it I try a different topping if you will. This one is by far my favorite. It’s fast, easy and has great taste! This would also make a fabulous #WeekdaySupper dish too! Preheat oven to 425. Cut spaghetti squash in half in place on top of a baking dish. Season with salt and pepper bake in the oven for 30-40 min. While the squash cools for a bit, drain the diced tomatoes and place in a saute pan. With a hand masher break up the tomatoes to the consistency you prefer, I like to mash it around a little bit so it makes a chunky sauce. Add garlic and season with salt and pepper. Once it’s warmed through add 2 tbsp of basil and stir one more time. While the sauce warms through take a fork and remove the insides of the spaghetti squash. It’s real simple to do, I thought it looked more difficult than it really was because it really does just “fall off.” I get as much as I possible can! Place it in a serving bowl and pour the simple sauce over the spaghetti. Top with fresh shaved Parmesan cheese and the rest of the basil. I confess. I ate the whole dish in one seating. I didn’t even feel guilty about it either! Don’t forget to check out what other 5 ingredients or less dishes the Sunday Supper team brought this week! Yay! Spaghetti squash will be here soon. I am bookmarking to make this when it does. Looks fresh and yummy! Every time I see a recipe using spaghetti squash I want to cry, I so wish I could get it here. I am going to try and grow it this year. I am not sure why it hasn’t made it over here because when I tell people about it they love the idea. I love when comfort food is also easy to make. A simply gorgeous meal. Reminds me I haven’t made spaghetti squash in awhile. Your version looks good! I love spaghetti squash and I wish my son loved it as much as I do because we’d be eating it a lot more. Yours looks so fresh and tasty! I have to make this very soon, it looks so good!! This sounds awesome! 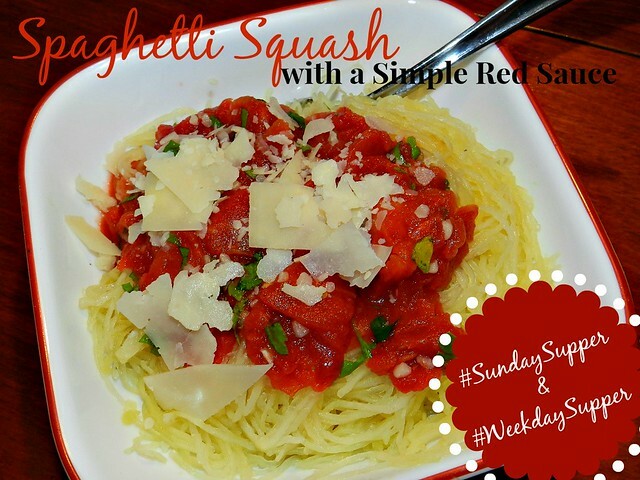 I love how simple it is and I’ve been looking for different ways to make spaghetti squash. I love spaghetti squash. . this looks SO good!! delicious! Wow! This looks so good!!!!!! What a great easy delicious recipe!!! I love spaghetti squash!! This looks yum – ty! I definitely share your love for spaghetti squash! I can’t believe it took me until only a few years ago to 1 – learn about it, and 2 – figure out that I adore it! Fresh and summery! Gotta try spaghetti squash this season! I love tomato and spahgetti squash together! This is the way I prepared spaghetti squash the very first time I tried it. It got me hooked! I have spaghetti squash growing in my garden, thanks to the compost, and I can’t wait to harvest some! I’m pinning this for the first spaghetti squash I get my hands on. I don’t usually get excited but this is a great idea. So the other day I went to the grocery store and when I got home and unloaded the bags I saw that somehow they put someone else’s spaghetti squash in my bags. I called the store and they said to just keep it. Now I know what to do with that squash. Healthy & Delicious! This is a winner in the 5 ingredient or less category!